She distributed help and heard testimonies. Call for a "safe return of refugees to Myanmar". Dakha sends Naypyidaw the recognition of Rohingya's citizenship. Church initiatives for the assistance of the victims of the conflict. Cox's Bazaar (AsiaNews) - "We are with the refugees from Rakhine and we will give them every assistance until they return to Myanmar." This is what Prime Minister Sheikh Hasina said yesterday during a 30-minute visit to the Kutupalong refugee camp at Cox's Bazar, near the border with Myanmar. During the inspection, the premier listened to the stories of some fugitives. Hasina invited neighboring Myanmar to stop " the inhumane persecution" of the Muslim minority of Rakhine and allow refugees to return from Bangladesh. The Prime Minister reiterated that Dhaka intends to maintain friendly relations with Naypyidaw, but "tolerates no injustice". 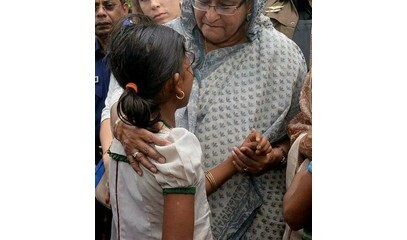 Listening to testimonies, Hasina said: "[Refugees] are human beings and will live as such. Why should they continue to suffer such misery? As its citizens, Myanmar has no right to deny citizenship. [The Burmese authorities] must ensure their security so that they can return to the country. " The premier also stated that the government is gathering names, addresses and identity of refugees from Rakhine, which Dhaka does not intend to take over. 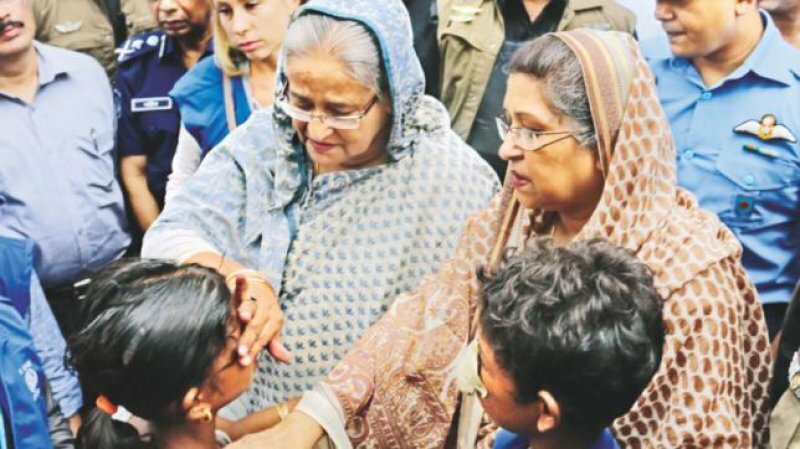 "We know their problems and it is our responsibility to take care of them - continued Bangladesh Prime Minister while distributing aid - That is why we have taken such measures to help them here to lead a dignified human life." According to the latest UN data, more than 350,000 Rohingya have fled to Bangladesh since the last violence last August 25. The refugees accuse the Burmese security forces of atrocities against humanity and wanting to throw them out of Rakhine. On the other hand, the military and the more than 30,000 displaced ethnic groups accused the Muslims of starting hostilities, and denounced the violence suffered by the Arakan Rohingya Salvation Army (Arsa). During the visit, praying to Allah for his blessing, many of the refugees cried and addressed the Prime Minister with the title of "mother". "Our country [Myanmar] does not want us and does not recognize us - they said - As a foreign premier, listen to our suffering!" 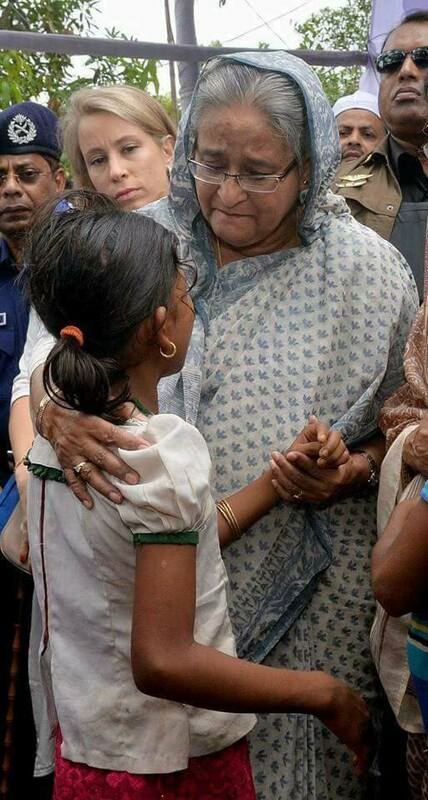 A woman named Jamalika, originally from Nisongpur (Mundu's Burmese District), told Hasina her story. She reported that Burmese Army soldiers killed her husband and two children before she and other 30 women were raped. In recent days, AsiaNews correspondent went among the refugees at Cox's Bazaar and reported other stories of violence. Faced with the serious humanitarian crisis, Caritas Bangladesh has taken the initiative to help the Rohingya. James Gomes, regional director for the Cox's Bazaar area, told AsiaNews today: "We presented our aid distribution plan to the authorities and hopefully will get the permits by the end of the week. We will supply each family with 15kg of rice, 2kg of legumes, 1kg of salt and oil, as well as some home and cooking products. A total of 13,550 Rohingya will receive our assistance. "